WASHINGTON (CNN) -- In the wake of hurricanes Katrina and Rita, the Federal Emergency Management Agency was slow to address early signs of formaldehyde problems in emergency housing and overstated actions it was taking to address the problem, according to a report released Thursday by a federal inspector general. A federal report released Thursday criticizes FEMA's response to formaldehyde problems in trailers. The highly critical 80-page report paints the picture of an agency that was overly concerned with its image to the detriment of the public. FEMA, the report says, reacted to the formaldehyde health threat only after media attention "grew to disturbing levels" and once delayed testing so the agency could "develop a public communications strategy" for the public and the media. Although federal tests found formaldehyde in emergency housing in October of 2005, just two months after Katrina, most of the tests weren't done until two years later, during winter when formaldehyde levels are lowest, the report says. "Because of the delays, the test results may have underestimated the extent of formaldehyde exposure that residents had experienced," it says. The report is the latest to address the federal government's response to Katrina and Rita, when FEMA faced the biggest challenge in the agency's history, trying to relocate many of the estimated 700,000 people displaced by the Gulf Coast storms. Some people were housed in hotels and apartments. But others were placed in more than 200,000 travel trailers, mobile homes and temporary, two-bedroom shelters known as "park models." Almost immediately, some residents began complaining of health problems, attributing it to formaldehyde, a strong-smelling gas that is federal authorities say is believed to cause cancer. In October of 2005, shortly after the storms, federal officials cautioned government workers to limit their time in travel trailers, but a similar warning was not give to the trailers' new inhabitants. The following March, a Biloxi, Mississippi, television station reported on a local couple who were having formaldehyde problems with their FEMA trailer. The inspector general's report chronicles initial efforts to address the problem. "FEMA officials did make some attempts to identify the extent of the formaldehyde problem, but they did so by trying to get an accurate tally of complaints from occupants rather than testing occupied units," the report says. The inspector general's report says that, in hindsight, a number of factors created a "perfect storm" for development of formaldehyde problems after Katrina. One prime factor, the report said, was that before Katrina and Rita, "complaints about formaldehyde levels in FEMA trailers had not surfaced and, therefore, FEMA officials were unaware that this should have been an issue of concern." • All of the units were some form of manufactured housing, which tend to have more manufactured wood products that can emit the gas. • Most of the trailers were hurried from factories to the Gulf, and didn't have time to release dangerous gases before being occupied. • The trailers were placed in hot, humid climates, increasing formaldehyde levels. 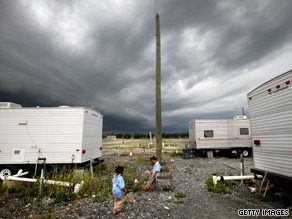 • And high numbers of children, the elderly, and people with prior health problems were living in FEMA trailers. All three groups have heightened sensitivity to formaldehyde. The report was released by Richard Skinner, the inspector general for the Department of Homeland Security. DHS is FEMA's parent department. In the report, FEMA officials said the document "does not adequately emphasize the compelling fact that there were no established formaldehyde standards for travel trailers." The inspector general agreed that there is a lack of standards. In a statement Thursday, FEMA spokesman Clark Stevens said FEMA "agrees with the Inspector General's findings" and has already made great progress in developing policies and actions to address concerns about formaldehyde emissions. "As a result, FEMA and our partners are far better positioned to respond to the temporary housing needs of disaster survivors than we were several years ago. Among other things, FEMA is testing several new forms of relocatable housing at a site in Maryland. It also is requiring manufacturers to have third-party testers conduct air quality testing to ensure units comply with new specifications.